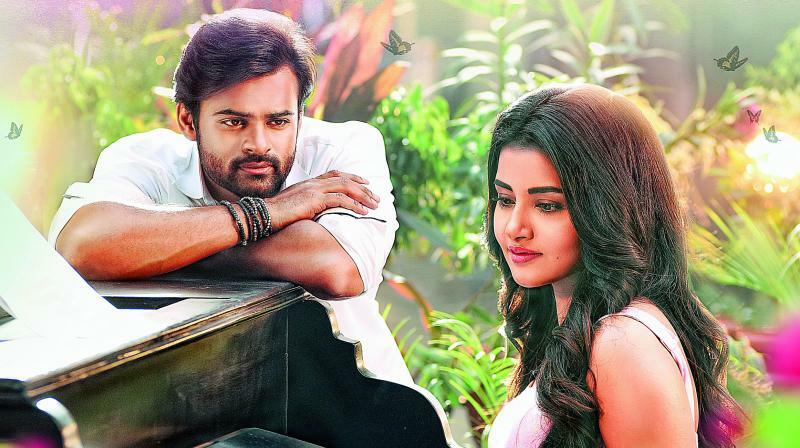 Tej I Love You Casts Sai DharamTej and Anupama Parameswaran in lead roles. Other cast includes Jayaprakash, Pavitra Lokesh, Surekha Vani, Prudhvi Raj and Viva Harsha. Tej gets separated from a family with certain issues and falls in love with Nandini after that they both try to take revenge these all come in first half. The director tried to increase the curiosity in the audience with the interval twist that the Heroine who came to express her love to hero met with an accident will forget the past. It would be nice if the second half would be more gripping and impressive. But Karunakaran failed to impress the audience. It Looks surprising Nandini forgets only what has happened after coming to India. Sai Dharam Tej and Anupama look very good on screen but there are no scenes to show chemistry between the lead pair. Director mainly focused on Hero and Heroine scenes it looks little boring. Family and emotional elements are very low, It looks good if Comedy is well distributed across hero and Heroine scenes. Director failed to provide a family sentiment and emotional scenes in Pre Climax drama. Sai Dharam Tej appealed as a mass hero in the previous film, also impressed as a Loverboy. Anupama Parameswaran popular in homely roles also impressed the audience with a modern look. Sai Dharam Tej and Anupama both performed well in their roles, Especially Anupama did justice to her role. Jayaprakash, Pavitra Lokesh, Surekha Vani, Prudhvi Raj performed well in their role. Viva Harsha tried to create some laugh. K. S. Rama Rao production values are lavish, Gopi Sundar Music is average only two songs attracts well, Cinematography work is good, Director Karunakaran succeeded in elevating Heroine character, but the routine story and the narrative script did not show his mark.